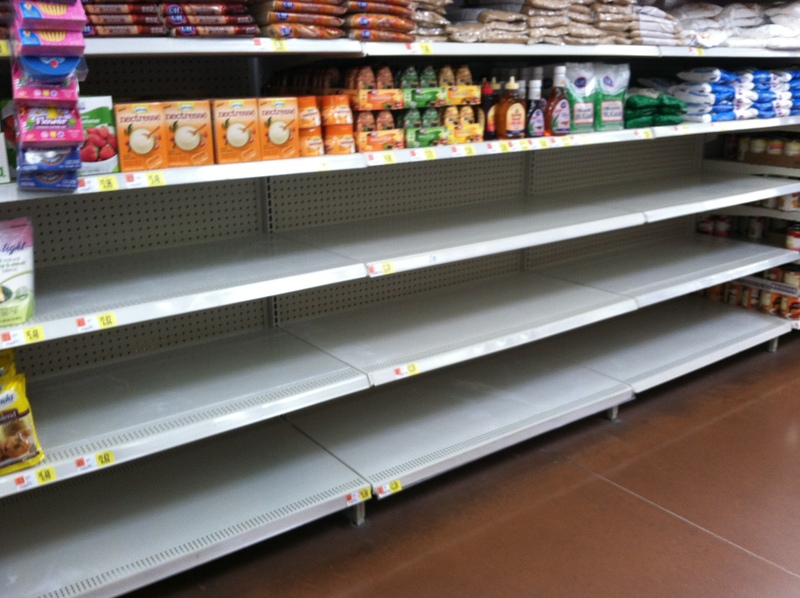 I took a quick pop into the happiest place on earth…Wally World! What?!?! Wally World is not the happiest place on earth? 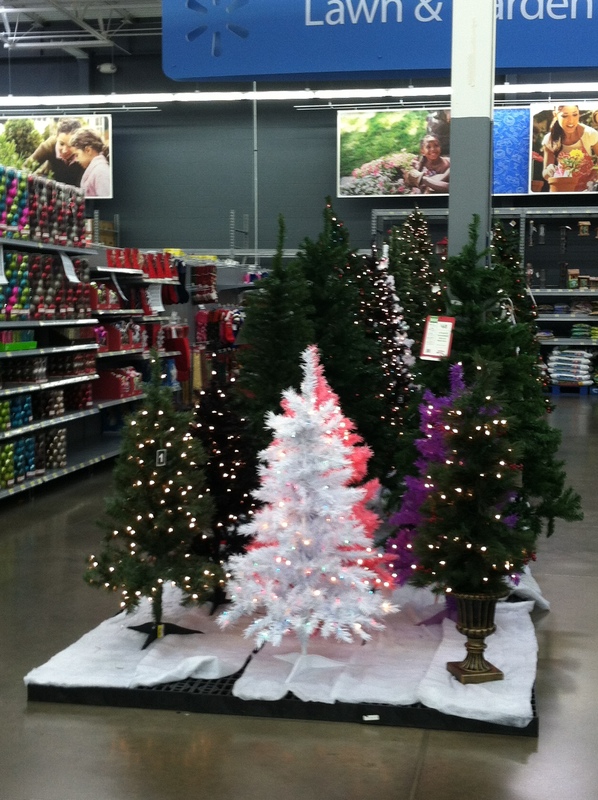 That’s not what the Griswold’s total me, bunch of liars. No wonder the moose wouldn’t let them in the park. Anyway, I had a short list of a few things I needed to grab. I was going to get in and out without fraying my nerves or killing my pocket book. You know how the check out clerk always asks you if you found everything you were looking for and you mindless say yes because you can’t say what you what to, because if you could, you’d say this? 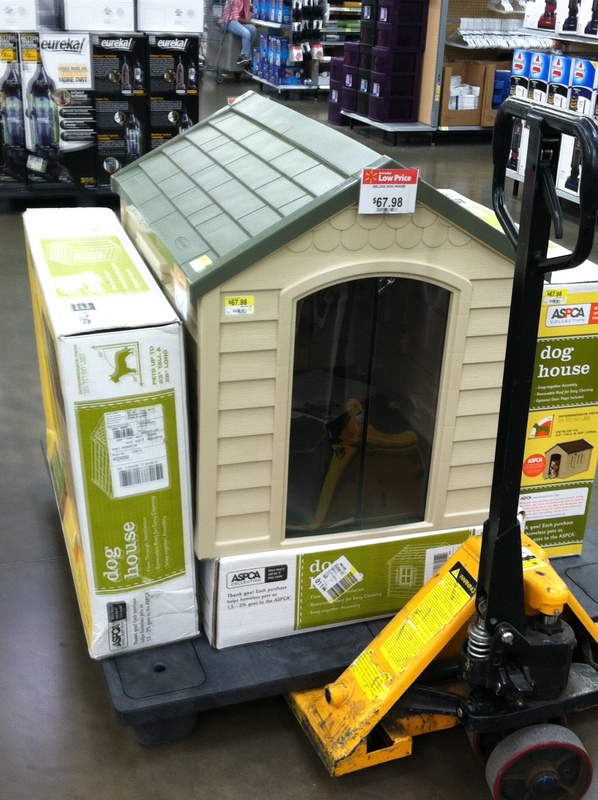 and I’m a little curious if you have a huge demand for outside, industrial style doghouses. Are they really for dogs or does the weather barrier style door indicate they are actually for husbands? Because if they are for husbands, then I understand why they are located in the home section and not the pet section and do you think my husband will fit in it? And another thing. Is there some big ration on sugar I should be aware of? I mean really. Who does this? I appreciate that you let me price match items, but when someone comes to the check out with 200 bags of sugar, don’t you give that person a nice talking to about sharing? And what’s the deal with this? That might be the last time she asks, but boy would I feel better. I shop at Wal-Mart. I shop there every week. I know they are an evil monopoly that push mom-and-pop stores out of business. I also know they have the lowest prices out there and will price match anything…ANYTHING. In order to compensate for the low prices, there are a number of things one must endure; the most interesting are my fellow shoppers and the employees. Luckily for me, I write this blog, so they also offer me weekly material. (Before anyone yells at me for dissing Wal-Mart employees, my brother is a former Wal-Mart manager, so I am well aware that not all employees are ‘interesting blog subjects’ but you and I both know there are a handful in every store.) As I shop there weekly (or more if I forget things), I hope to make ‘Lessons from the checkout’ a regular post. 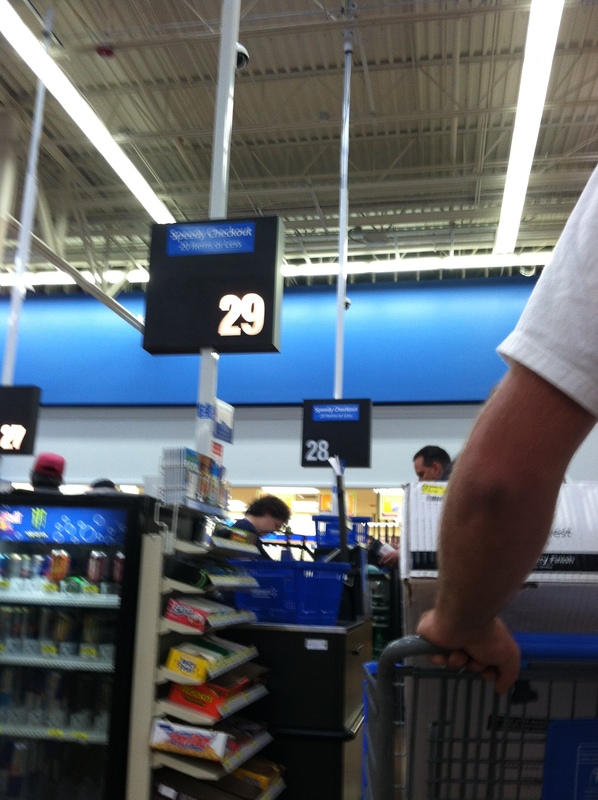 Picking a checkout lane is probably the most crucial decision you will make in Wal-Mart each trip. 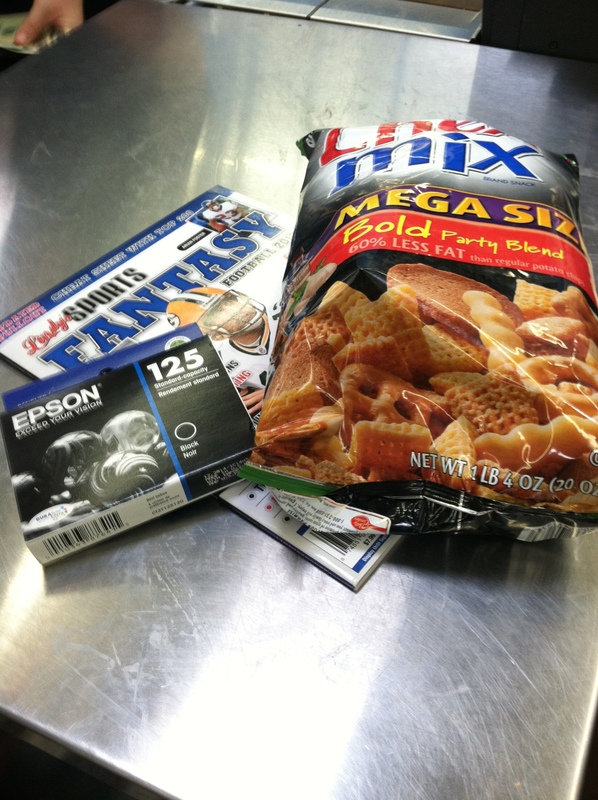 Pick poorly, and you could be stuck in the check out twice at long as your shopping trip took you. Younger males are almost always the wrong choice. They’re usually ok speed wise, but they bag poorly. Squished bread is always bad. Middle aged women are usually a good bet. No nonsense, want to get the job done well and quickly. Younger women…its a role of the dice. Well this week, I took a gamble and hit the jackpot. Now she’s not overly speedy and her bagging skills leave a lot, I mean A LOT to be desired, but she is the best talker out there and sometimes, that is a trade-off that is worth it. I don’t want to give away her identity, so I’ll just call her Jane. I went to Jane’s line and started the regular chit-chat, talking about the nice weather and the upcoming weekend. Jane mentioned that she was going to Kansas City this weekend with her boyfriend. Once Jane starts talking, she just talks. She doesn’t really wait for a response. This is no give and take conversation. This is the long and short of my talk with Jane. See what I mean!!!! She might put my shampoo with my crackers, but she’s golden!